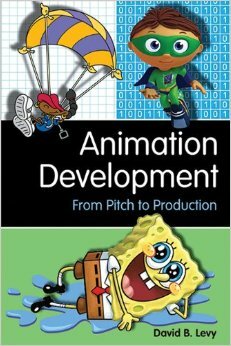 I just finished David Levy’s “Animation Development: From Pitch to Production“. This book is helpful on many levels, not merely for the next potential Matt Groening, but for writers and cartoonists of all stripes, whether you’re working on the next “Rick and Morty” or just slaving away on the next “Jetpack Jr.” comic strip. The first few chapters alone, detailing the content necessary for any good “pitch bible”, forced me to think, and re-think, character over and over again, as “Plastic Babyheads” gradually transitioned to “Jetpack Jr.” this past year. Character is the honey that keeps the flies coming back; whether to comic or cartoon, novel or TV series. Of course, that’s no news to even the most inexperienced writer, but artists are most interested in pretty pictures–and so it was a lesson learned late for me. Nevertheless, I worked and worked at it–and put Levy’s book aside until I felt I knew who my characters were. That didn’t come easy. I didn’t start with a defining concept(other than an Earth invaded by plastic babyheads), or the idea of pitting this character against that one. They developed more or less organically as the strip has evolved, and it’s taken time to get to know them. Picking up with Levy’s book where I’d left off last Fall, I found the remaining chapters no less educational, and just as challenging. The life of the creative animator/story-teller described within its pages is fraught with ups and downs, loads of disappointments and rare success. Frankly, I finished it feeling defeated before I’d begun, so difficult is the world of television animation development Levy describes. If you have illusions about overnight success, this book will wake you up to reality pretty quick. It’s loaded with a lot of insightful information that should help budding young animation developers pitch their ideas and navigate the rough waters of development, should they be so lucky. But it’s clear, animation development is not for the faint-of-heart–and if you don’t want it badly enough, this book will ward you off the attempt. (thousands?) of strips that never get off the ground, and many more that get to one stage of development but not the next. And every step of the way is fraught with the same emotional highs and lows. It’s not for the faint-hearted. Obviously, the subtext of this post is that I’ve been thinking of the next step for “Jetpack Jr.”, both as comic strip and as animation. In both cases, the chances are slim; realistically next-to-nil, and I know that(accepting it is another thing). At this point in my life, I still have dreams( yes–geezers still dream!) but very few illusions. I work on “Jetpack Jr.” because I love it, I’m obsessed with it- it’s great fun and, go figure, I have to know what happens to these people. If I put together a pitch bible, or a submission package, it’s not only because I have a hope for success(sure I do), but because it’s a learning experience, a creative endeavor in itself. The process teaches me more about the strip, its world and its characters–and makes the strip better. Putting together a pitch, or working on sample animation–can only be a plus for me. (All of the work on character this past year wouldn’t have happened if I’d not been challenged by David Levy’s book.) Not only will I be creatively engaged in a medium I’ve always loved and admired, challenging myself to broaden the range of my abilities– I’ll bring my experience back to the classroom, to my students! And… if I’m very lucky, I might make something good, something I can be proud of. Jetpack Jr. may never make it to syndication, and it may never be an animated TV show. I mean, get real–right? But there’s always the next step–and continually stretching oneself, as a story-teller and as an artist–will have a different payoff. If I were to let the challenges posed by David Levy’s fine book dissuade me from trying, then I never wanted it bad enough in the first place–and the only one who loses in that equation….is me. ← Jetpack Jr. in The Sunday Funnies! Great post. I'll have to pick this book up. I added the link above.